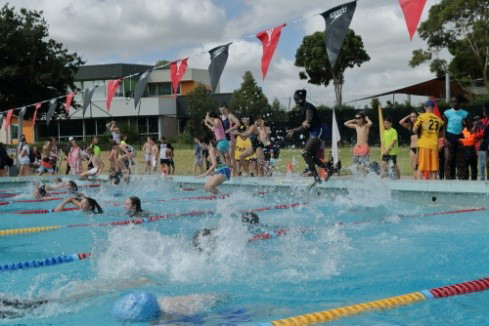 The House Swimming Carnival is held yearly. The event involves all students across the campus and aims to get all levels of swimmers in the pool. The races throughout the day vary from single strokes events to relays, with a number of novelty type events also included. Scores are tallied and ribbons are awarded, all contributing towards the final House scores at the end of the day. Along with winning the carnival, all eight Houses are given the opportunity to show the judges their best House spirit in an attempt to win the title for the House Spirit Shield.